From Kaa to Boa, reel-life snakes, whether in live-action or animation, are almost always the ultimate nemesis. India, however, offers a better deal to these slithering creatures owing to their mythological roots what with Lord Shiva wearing one around like a garland as a mark of wisdom. And while the West doled out its fictional comic-book heroes like Batman and Spiderman, we've got our very own Nagraj -- the Serpent King with innumerable superpowers. So it's no surprise that Bollywood has conflicting interpretations for this reptile in its movies -- both as friend and enemy. With Hisss, directed by Hollywood's Jennifer Lynch starring Mallika Sherawat in all her prosthetic creepiness is all set to spew venom on its wrongdoers, rediff.com lists some of Bollywood's best-known snake movies. Unlike the 1954 movie of the same name featuring Vyjayanthimala which was a Romeo-Juliet brand of romance woven against two warring tribes trading in snake poison, the super-hit 1976 multi-starrer, directed by Rajkumar Kohli roped in stars like Sunil Dutt, Feroz Khan, Vinod Mehra, Mumtaz, Rekha, Jeetendra and Reena Roy as its eponymous heroine as a she-snake on a vengeance trail after her mate is slain by a group of guys. A couple of decades later, Kohli attempted a similar theme crammed with biggies like Sunny Deol, Akshay Kumar, Suniel Shetty and Manisha Koirala to revive son Armaan's sagging career with an eminently forgettable remake, Jaani Dushman high on tacky SFX. Any mention of Nagina conjures images of Sridevi's famous serpentine moves against Amrish Puri's fierce snake charmer to Main nagin tu sapera in Harmesh Malhotra's Nagina. In this snake-mortal romance, Rishi Kapoor falls for the charms of Sri's beguiling ways and blue cosmetic lenses without realising she's actually a cobra who can change into human form. The duo gets married but an evil snake charmer on the pursuit of an all-powerful jewel won't let this become a happily ever-after. Following the supernatural film's smashing box office response; Malhotra came up with its sequel Nigaahen with Sri and Sunny Deol but failed to repeat its predecessor's success. What happens when a deadly snake woman decides to punish her enemy with poisonous looks and dramatic dancing? A monstrosity named Sheshnaag. 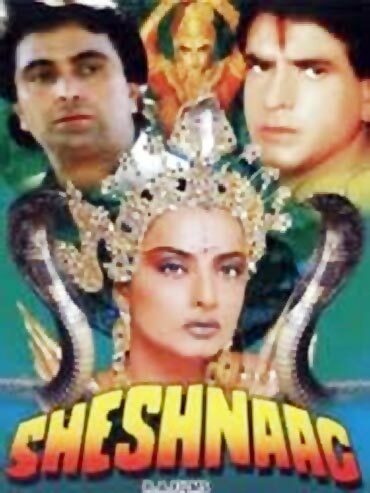 In K R Reddy's laughable snake fantasy, Rekha/Madhavi portray an over-the-top 'Ichadaari nagin' with super-mutant Mystique-like shape-shifting powers. What instead grabs your attention is the outlandish headgears and garish attire worn by its star protagonists. 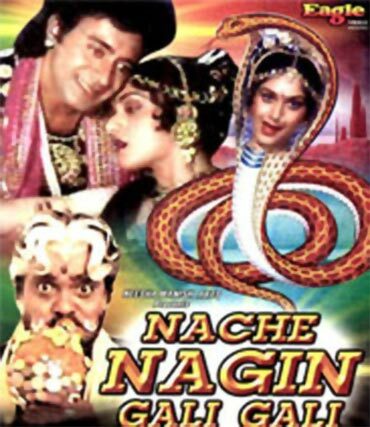 Even Meenakshi Seshadri couldn't escape the lure of playing a seductive snake-woman in Nache Nagin Gali Gali along with Nitish Bharadwaj, best known for his memorable portrayal of Lord Krishna in B R Chopra's television epic, Mahabharata. Needless to say this song 'n' dance session around supernaturally-gifted snakes garnered very little notice. After flaunting her assets under a gushing waterfall in Raj Kapoor's Ram Teri Ganga Maili, Mandakini reunited with her first co-star Rajiv Kapoor to slip into the slippery skins of Naag Nagin, an obscure 1989 B-grader. One look at director Shantilal Soni's filmography and his fascination for snake-themed movies is quite apparent what with titles like Naag Devata, Mahashivratri, Naag Mandir, Naag Mere Saathi and Nagin Aur Suhagan. In the last one, Bollywood's screen mom Reeta Bhaduri plays a woman who rescues a family from the fury of a scorned Naag Kanya. Long before Aamir Khan established his credentials as a perfectionist, he signed on career-best embarrassments like Tum Mere Ho. Here's the deal, Khan plays an impoverished snake-charmer with paranormal gifts and is in love with a wealthy man's daughter, a development that meets with expected resistance. At the same time, he runs into some trouble with a snake couple proficient in taking human form. In Bollywood, snakes and sexuality go hand in hand. With venom injected in her system, she's pretty much a serpent in the garb of a hot woman. And that makes hunting for unsuspecting prey no less than child's play for Pooja Bedi in her super lame acting debut, Vishkanya. To think Deepa Mehta's mostly unremarkable Videsh deals with domestic violence meted out at an immigrant Indian woman. The narrative, however, employs elements of Girish Karnad's play Nagamandala wherein, following an inexplicable turn of events, a mythological snake falls in love with Preity Zinta's tormented character. And in the process, lends her strength to deal with her current situation. Kooky but true. The star Mallika would love to bite! Mallika Sherawat's unknown talent, revealed!